Genesis is a brand of premium cars that is a subbrand of Hyundai Motor. It is presented by two models of sedans G90 and G80. to the exit is prepared model G70 with variants of a sedan and a coupe and also 2 crossover GV80, GV90. In the summer of 2015, Hyundai Motor Company introduced the concept of a two-door four-seater coupe Vision G in the US, as a prototype of the style for the future family of premium segment cars. In November 2015, the company officially announced the creation of the Genesis sub-brand. Models of cars will receive an alphanumeric designation. In December 2015, the first car of the brand was introduced - a representative sedan Genesis G90, which became the successor of Hyundai Equus. Later, the car went on sale in the markets of South Korea, the United States, the Middle East and Russia. The car is produced with three types of engines: a V6 volume of 3.8 liters with a capacity of 315 liters. with., Bi-turbine V6 volume of 3.3 liters capacity of 370 liters. with., and also V8 volume of 5 liters capacity of 425 liters. from. The second model of the brand - sedan Genesis G80, was presented at the North American motor show in Detroit in January 2016. The car is a restyled version of the Hyundai Genesis second generation model, introduced in 2013. In June, at the international motor show in Busan was also presented a modification of the Genesis G80 Sport, featuring a modified bumper, radiator grille, rear diffuser and having four exhaust pipes. The car is produced with the same engine types as the G90. In March 2016 at the Auto Show in New York Hyundai introduced the concept of a sedan called Genesis New York Concept, which may become the prototype of the G70. The premiere of the Genesis G90 in Russia took place in September 2016. 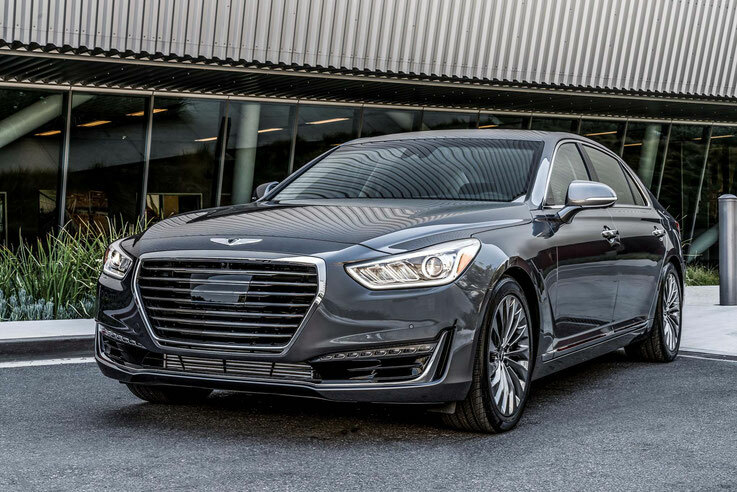 The presentation also disclosed the manufacturer's plans to produce seven Genesis models by 2020, including three sedans, two crossover cars, a sports coupe and a limousine, which is an extended version of the G90 sedan.